As the world’s population rockets to 9.5 billion by 2050, improved methods of protein production are inevitable. Fish protein is part of the mix. In fact, the FAO estimates that farmed fished will supply nearly two-thirds of the world’s food fish by 2030. Global tilapia production is expected to nearly double to 7.3 million tons annually by the same year. These numbers shout that the market needs new protein suppliers and new brands. But, creating a new brand is tough. Building one from scratch in a category that demands impeccable quality, is price-sensitive and fickle, daunts even the staunchest marketers. PezCo Aquafarming accepts these challenges. The owners of this family farm realize that restaurant and grocery customers demand more than a top-notch product. That’s why its new offering – red tilapia filets – is supported by an operating philosophy grounded in home-country pride, passion and unquestioning belief in its employees. PezCo resources include biosecure floating enclosures and lakes fed by mountain springs. The Aquaculture Stewardship Council and Global Aquaculture Alliance certify their sustainability. FDA gives its seal of approval. HACCP protocols are in place. What these production and processing practices mean is that high-quality, fresh fish can be delivered to the U.S. in 36 hours or under, then enjoyed in a restaurant or bought in a grocery within 72 hours. This supports PezCo’s story to use sustainable farming practices to make it possible for families to get fresh and nutritious meals at reasonable prices. Just as the company lives up to its product promise, it delivers on promises to employees. It and its partnering family farms routinely hire persons with disabilities and mothers who are the sole breadwinners for their families. They also support employees with education, housing, health insurance and pension plans. This support helps them make a difference for PezCo. 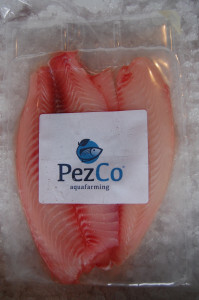 In turn, PezCo “delightfully makes a difference” for its customers. And when you make a delightful difference for customers and employees, your brand’s story gets told from beginning to end as many times as there are fish in a pond.